Yesterday marked 2 years since I started this blog. I was surprised. It felt like longer. I have discovered so much and yet have so much growing still to do, some (ok, A lot) of which is in the same areas I was writing about 2 years ago. I also haven’t written anything here for about a year. I have wanted to, in fact I’ve collected many thoughts I hope to share at some point. But after laying so much out here, and examining it, my heart has been changing slowly, as I prayed and worked and asked the Lord to help it change. Writing and testifying of the power in mothers and the things I am learning was part of the process of change. My desire has turned to my family more than ever, and that meant that if I had time to either spend with my kids, or write here, I chose the kids. Yet there have been some times when I have felt like I should really share something here, and I didn’t simply because I didn’t know where to start to catch up since so much time has gone by. Well, I’m not going to be able to fill in the last year, and I’m not going to try. But I do want to share something I’m learning that has made the difference between my having to force myself to serve in my home and family, and desiring it. And that is that True change starts Within. We can attempt to mold our behavior and outward choices to the actions that we know would be best. But its always going to be a struggle until what’s inside changes. When what we desire in our hearts changes, then everything we do changes because of it. That doesn’t mean stop trying if you don’t desire what’s right and good. Acting on truth helps us get a testimony of it, and its part of becoming what we want to be. It is essential to keep trying even when the desire isn’t there. But once that desire is kindled and it becomes strong, that is what drives the action, not the other way around. And then it is not a difficult choice to make anymore, it is Who you Are. Our natures can be changed (with help from God), to desire naturally exactly what God desires us to do, and to be what we need to become. The heart is what we come home to, where we get our strength to get up and do the many things required of us. It powers and strengthens and sustains us in all we do. God is helping change my heart to desire to spend my time and focus more deeply on my family. It’s becoming the first thing I think of and want to work on, where often it used to be somewhere down the list, below reading in my room alone, or blogging, or hobbies, or studying, or even facebook. This doesn’t mean I’ve stopped caring for myself or developing my talents. It just means that the hunger I experienced for those things is often matched and even exceeded by a hunger to bless my family! It’s a wonderful feeling. I still have habits to overcome, but it is much easier when it is just a habit to change as opposed to fighting off an opposing desire. My desire is in my corner more now. And I am so grateful. The desire in my heart now has me, surprisingly, happy and driven to work on my home. I am seeing how, just like my heart is my center of strength, peace, and sustenance, my home is our family’s center of strength, peace, and sustenance. If I want my family to feel full of love and light, I need my home to feel that way. If I want us to be clean, and purposeful, and prepared, I need a home that is that way. If I want to get the cobwebs out of our minds and off our eyes and get the clutter out of our schedules and have clarity and cleanliness in our hearts, we need to clear out the corners and recesses of our home. I have a desire in my heart to be able to figuratively etch the words ‘Holiness to the Lord’ on myself, and on the walls of my home, and have that be the motto of everything I do. I want to look at each part of my heart/home, even the closets no one sees but me, and make them holy places. This doesn’t mean we don’t live here or that if you come over you will see a huge sparkling transformation. It looks almost the same so far. I’m still learning how to clean well (not my talent, yet), I do have 6 messy kids, and I don’t think I will ever be caught up on laundry or dishes because we feed the hungry and clothe the naked here, and that is also part of my mission. But my desire is transforming and I’m motivated to create beauty in my home for reasons that matter to me, that go deeper than the superficial. This desire is extending into a desire to really be a queen of my home, and to be Sovereign in it, with my husband, to be deliberate in whatever we bring in, allow in, and keep. If I work hard to cleanse the temple, so to speak, and create and atmosphere of light, and then carelessly allow other teachers and influences to come into my home and plant darkness and figurative dirt and teach my family to love those things, I’m not really keeping my home or being a powerful creator at home. Not surprisingly, I have met with some resistance from my kids about some of these things. I can’t transfer my desires automatically to them. But I feel a little more emboldened to stand firm despite pressure from inside the family or from outside. It’s a war on the darkness and I won’t let it win in my home. I am fired up. I’m cleaning house in more ways than one. I believe that changing the state of my heart, to begin with, and the state of our home (for the right reasons, not just for appearances), and fortifying our boundaries to protect this sanctuary, will help my family transform from the inside out and give us a safe place of strength to come back to again and again. Every lasting transformation comes from within our hearts and homes first – changing ourselves, our families, our communities, our nation, the world. 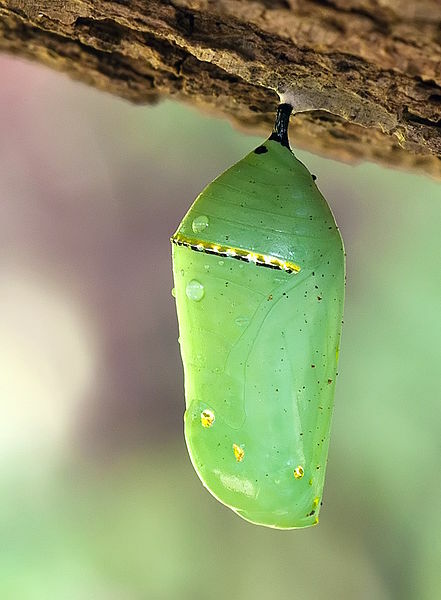 Like the transformation that happens in a cocoon, much of it is unseen to outside eyes and happens privately, slowly. Sometimes we don’t see it ourselves. But we can become new creatures, with new hearts. I’m grateful for the grace which allows hearts to change and homes and families to become new, joyful, and holy. I have great hope in this (and lots of great work to do!). Question: What feeds your desire to nurture your home and family? What do you do to help that desire increase if it is not strong enough to motivate you? Another question (I could really use some ideas on this): If you have felt a call to ‘raise the bar’ in your home and your kids aren’t on board, how have you reconciled that with your kids agency and family harmony and instituted changes?